Congressman Seth Moulton says a tunnel like one that London’s building could link North and South stations without disrupting life in Boston. Seth Moulton does not seem like a crazy man, but the congressman from Salem is telling me something crazy. He thinks Massachusetts should build another multibillion-dollar tunnel under the city. “The back of the envelope math is very compelling,” he told me recently over lunch in Boston. Not only that, but advances in tunnel-boring technology mean the good people of the Commonwealth would hardly feel the kinds of disruptions we endured during the Big Dig. “People in the city of Boston will not know a tunnel is being built,” Moulton said with a straight face. Readers of this column know this idea by another name: North-South Rail Link. It’s a transportation pipe dream that has been kicking around for four decades and whose biggest advocates have been two former governors, Mike Dukakis and Bill Weld. They have famously put aside partisan politics to make a case to the sitting governor, Charlie Baker. Until now, Baker and the rest of the Beacon Hill establishment have been humoring the two elder statesmen about their 2.8-mile tunnel to connect Boston’s two main train terminals, North Station and South Station. But Moulton, who has been part of Dukakis’s rail study group, is breathing new life into the effort and rallying the Massachusetts congressional delegation to get behind it, as well. It’s one thing for two retired pols to hitch their wagons to a minefield of a project, but it’s quite another when a 37-year-old rising star of the Massachusetts Democratic party decides to go to bat for it. Here’s how. Most everyone thinks of Moulton as the decorated military veteran, but before he won his seat in 2014, the Harvard MBA grad spent a year working on a high-speed rail project in Texas. In other words, he knows a lot about trains and transportation. Moulton agreed to join the Duke’s group with one caveat: The freshman congressman would come into it with an open mind and draw his own conclusion on whether the rail tunnel is worth pursuing. He has spent the past year in research mode. 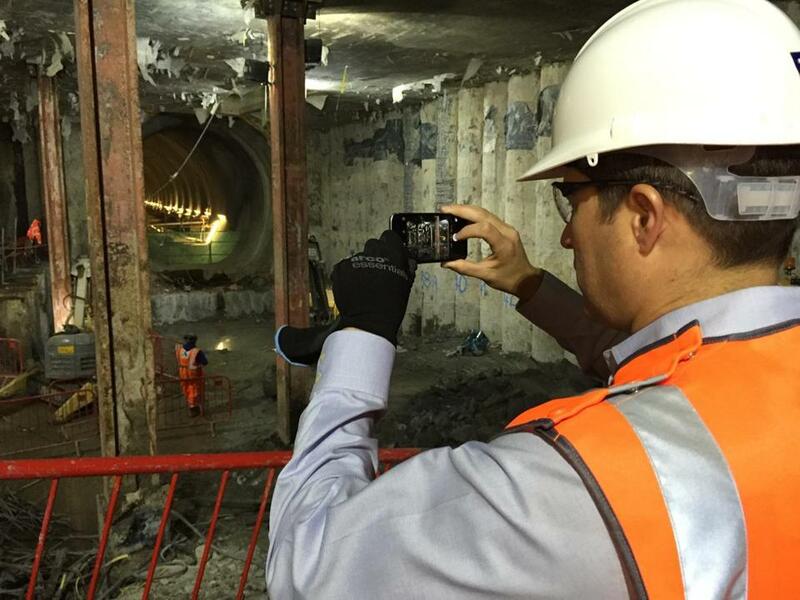 He found that cities around the world have launched similar train projects, and even visited one in London last month, hard hat and all, where a tunnel is being built as part of a transit expansion known as Crossrail. Moulton is increasingly convinced that connecting the two stations is the way to go. The link would finally bring uninterrupted service to the Northeast Corridor, which means a person who gets on in Washington could ride all the way to Portland, Maine, without switching trains. It also means people on the commuter rail could more easily travel to either North or South stations without needing to hop onto the T.
The design would also reduce congestion at both stations. But what about our tunnel phobia? The Big Dig, which depressed the Central Artery and brought us the Ted Willliams tunnel, was an exercise in costs gone wild, with a final price tag of more than $22 billion. Moulton admits we are still recovering from a “Big Dig hangover.” He assures me that construction techniques have evolved, and that costs can be put in check because this is a much simpler project. The Big Dig was akin to performing open-heart surgery, with construction taking place while cars whizzed by. Instead, Moulton told me, a hole could be drilled just south of South Station and another one in Charlestown. The tunnels would be built more than 100 feet underground without disrupting train service — or much of anything else. Based on estimates from comparable projects, Moulton thinks the cost would be about $3 billion, not the $8.7 billion that then-governor Mitt Romney proclaimed it would be before killing the idea in 2003. Moulton believes the link, because of its broad impact, could also attract federal and regional dollars, and even some from the private sector. This all sounds great, but readers of this column also know that Governor Baker prefers a $1.6 billion expansion of South Station. It’s also hard to see how Baker could attach himself to something that has been dubbed Big Dig II. Perhaps she is being diplomatic, but Baker’s transportation secretary, Stephanie Pollack, said the administration is “open minded” about putting the rail link back on the list of potential investments. Pollack did sign off on a $2 million feasibility study to analyze everything from cost to how many riders would benefit. This sounds a little familiar, a bit like our failed Summer Olympics bid. A study to show what the Baker administration hopes to find. But Moulton remains persistent. He plans to send a letter — signed by nearly the entire Massachusetts delegation, including US Senator Elizabeth Warren and US representatives Mike Capuano, Stephen Lynch, and Richard Neal — urging Baker to take the study seriously. Frankly, I was surprised to see Lynch on board, given that he has been trying to broker a deal to make the South Station expansion plan a reality. Turns out the South Boston Democrat might have signed out of courtesy. Another head-scratcher was Neal, whose Western Massachusetts constituents are still miffed about the Big Dig’s sucking up of all the transportation dollars for the rest of the state. Neal told me he’s looking for “regional equity” and the chance for Springfield or the Berkshires to get train service. “I’m not against it as much as I’m for balance around the state,” Neal said. So it goes. The North-South Rail Link lives on, and with it, the hope of another generation that Massachusetts will get a transportation system it can be proud of. Clarification: An earlier version of this story didn’t provide Michael Sabia’s full title. He is the CEO of Canadian pension fund Caisse de depot et placement du Quebec, and sits on the board of its infrastructure investment company, CDPQ Infra.